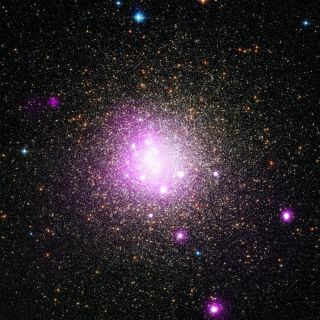 This image combines a visible and X-ray view of NGC 6388, a globular cluster that is home to a white dwarf star that appears to have shredded a passing planet. Scientists using several telescopes, including NASA's Chandra X-ray Observatory, found evidence that a planet in an ancient cluster of stars on the edge of the Milky Way drifted too close to a white dwarf star and was ripped apart. NASA officials explained the discovery in a video on the planet's death by white dwarf. White dwarf stars start out as any normal star about the size of the sun, but eventually swell into red giants while they burn up the hydrogen in their core and fuse it into helium. When all the hydrogen is gone, only the star's core is left —a dense sphere with a radius about one hundredth the size of the original star, but with almost the same mass. The dead stars' density creates a strong gravitational pull, more than 10,000 times stronger than the gravitational force at the surface of the sun, according to NASA officials. Researchers using the European Space Agency's INTErnational Gamma-Ray Astrophysics Laboratory (INTEGRAL) discovered the possibility that a white dwarf tore a planet apart when they found an unexpected source of X-ray radiation in globular star cluster NGC 6388. They initially thought the radiation was due to hot gas swirling toward an intermediate-mass black hole thought to be at the center of the cluster. The globular cluster NGC 6388 shines purple in this X-ray view from NASA's Chandra X-Ray Observatory. A second look with Chandra X-ray Observatory, however, revealed that the X-rays were actually coming from a point off to the side of the cluster's possible black hole center. Scientists continued to monitor the radiation for 200 days with the X-ray telescope on board NASA's Swift gamma-ray burst observatory, an international mission that aims to solve the mystery of what causes brief and intense flashes of gamma-ray radiation in space. "While the case for the tidal disruption of a planet is not iron-clad, the argument for it was strengthened when astronomers used data from the multiple telescopes to help eliminate other possible explanations for the detected X-rays," NASA officials wrote in a statement.